Publisher’s blurb: Young, urban Natives powerfully show how their culture and values can survive—and enrich—city life. Most of our posts are focused on novels, so for this month we decided to take a little time with a different format for a change. 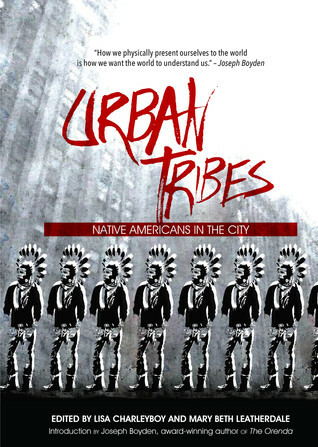 A few of us were able to get review copies via Netgalley and will share some of our thoughts about Urban Tribes here. This collection really highlights the diversity of urban Natives. I appreciate the many ways that the contributors used to express themselves. There are essays, but it delivers more than essays. As with Dreaming in Indian, the variety of formats makes this collection stand out. People contributed poetry, artwork, photo essays, interviews and more. Charleyboy mentions that “desire for defining our identity.” This can clearly be seen in the photo essay by K.C. Adams titled ‘Perception.’ Each person has two photos of themselves featured side by side. One is labeled with a racist remark and one is labeled with terms they’ve used to define themselves. It’s a powerful collection. To see the photo essay, visit K.C. Adams’ website here. I really appreciated the essay by Neebin Ishkoday (Oji-Cree) about her time moving from the reserve to Thunder Bay and the racism she faced there. The racism inspired her to become an activist. She closes her essay with this, “We need to learn to speak up for ourselves–especially young people who face racism and discrimination.” Collections like this are one place that these voices can be heard. Jessica: The thing I find most powerful about the collection is how many perspectives and voices are showcased. The focus is on “telling our stories”, as opposed to other people speaking on their behalf. Like Crystal noted, each piece in the book is different — there are interviews, articles, poetry, art, and even social media. Crystal: Contributor and author Michael Woestehoff (Navajo) said, “First, there needed to be more tribal citizens telling our stories from our perspective and through our eyes.” This work and the previous book, Dreaming in Indian, are perfect opportunities for tribal citizens to tell those stories. Dr. Adrienne Keene shares her post from earlier in the year, “Dear Native Student, You are Loved.” In addition, the social media tag #DearNativeYouth is highlighted. The hip hop duo, Mob Bounce, explain that they have a responsibility to all youth. This book provided a space for young voices to be heard, but it also speaks directly to youth. It speaks of hope, community and strength. Also, Debbie Reese’s has an excellent review of Urban Tribes here. Karimah: What struck me most about Urban Tribes was the fact that so many of the stories shared were by folks who had encountered racism and discrimination, but didn’t let that stop them, and were also devoted to helping future generations succeed. A number of the contributors found themselves the “token” in a variety of spaces, and decided to create their own support systems. I found what the young men of Mob Bounce said, “It’s been prophesied that we are the generation that will make the necessary changes to ensure a better world for our future generations,” pivotal because a number of the stories shared in Urban Tribes were about young people speaking up – about their generation specifically, working to bring about change. My favorite piece was the spoken word piece “Love You Some Indians” by poet Roanna Shebala. I could imagine the power and strength of her words as she wrote about how American/Canadian culture loves the ideas/stereotypes of Indians, but doesn’t actually love the people. It reminds me of Amandla Stenberg’s YouTube video that pointed out how America loves Black culture, but doesn’t love the people. I feel like if our youth like Roanna and Amandla keep speaking out, change will eventually come. Terrific post about a terrific book!